Bojan Radovič reused the star as a symbol, which after the fall of the Berlin wall and with it the fall of communism in Europe, is more and more emptied of its “original” communist revolutionary meaning. Today, as time passes, the star simply floats around countries, brands, contexts etc. Radovič points to this shifting of the meaning of the star produced by the capitalist process of branding, which slowly and steadily removes from the (red) star its historical and revolutionary power. His photographs are more than just keeping track, photographing what is actually happening with the star. He constructs a condition showing a symbol that is caught in the process of being refilled with the easy consumerist world of capitalism and emptied of its past socialism. Radovič is concerned with this in-between meaning produced by the image of the star and its photograph. This in-between is an interpretative space that allows for new ways of thinking and seeing the image of the star as well as photography. Let’s move now toward the title. “The Icon” shifts the symbol of the five-pointed star towards a sign. The sign usually points to something else; it consists of the matched pair of signifier and signified. Some also add to this pair the referent, which is a concrete object and is exchanged with the signified, i.e. it is sometimes seen in its place. The signifier is the pointing finger, the word, the sound-image. The signified is the concept, the meaning, the “thing” indicated by the signifier. It needs not be a “real object” but it is that to which the signifier refers. The signifier and signified form a core element of semiotics. Peirce established the difference between the icon and the sign as index. Index is a mode in which the signifier is not arbitrarily but directly connected almost physically or causally to the signified (as is the case with natural signs, for example smoke is connected with fire). On the contrary, in the iconic mode, the signifier is perceived as resembling or imitating the signified through a system of similarities. Insisting on the iconic moment of the five pointed star, Radovič argues that the star in his photographs just resembles and imitates the (red) star. It is important to state that pure icons do not exist, as there is always a cultural convention (socially and historically defined spaces of meanings) involved in all ways of dealing with the meaning of signs. This convention determines the way we relate to the icon in the last instance. The chain of meaning that is established between signifier and signified is temporally, historically and socially determined. Bojan Radovič tries to find a very different set of meanings of the star as a sign. He is searching for it in almost impossible places. This is underlined by the framing, shooting, capturing in his photographs of the star through a variety of formal photographic solutions. One part of the series exposes the centrality of it; the whole space of the photograph revolves around the star’s central position. The star is placed centre stage and the photograph is completely subordinated to this centrality. The other part of the series is a follow-up of snapshots that capture the star as being suddenly and spontaneously overwhelmingly present in everyday reality. Radovič’s photographs therefore interpret the star as nowadays “signifying” things other than itself, as being part of the whole system of signs. He extracts the familiarity of the meaning of the (red) star and transposes it toward many other meanings. This transposition shows that Radovič is concerned with the question of the contemporary semiotic field of photography. The semiotic here is the interest within the medium of photography to analyse and think about the signification and communication of signs and symbols in the situation of a completely globalized world where the circulation of signs and symbols reaches the point of almost an IMPERIALISM of circulation. Radovič also insists that this semiotics is not just a concept in the mind, but that the “star” cohabits with us. He searches for the star in everyday reality and this is why each of his photographs bears the subtitle where it was found. He could just fake it, using digital possibilities of photography, but he insists on the fact that these stars exist materially; without their existence, photography would not exist either. With this, he is coming near the condition that Roland Barthes in his book Camera Lucida (originally published in 1980) considered the definition of photography. The star is not just a notion of a thing, a concept in the mind, but a material imprint in the world that surrounds us. Rosalind Kraus asked what is the status of photography when “things” are no longer necessary, when the “photorealistic” simulation of reality (as in Hollywood special effects) is considered by some to be more “real” than indexical images because it gives a greater sense of “immediacy”? Could there be any other symbol to follow or shoot? Radovič was a child of socialism and today in the time of neoliberal global capitalism he is a highly respected photographic producer and author. Maybe this life caught between two historical periods grants him the authorization to follow his dream or maybe the nightmare of the (red) star. In his article from 2001 “The Footprint and the Readymade – Photography as Art,” Sven Lutticken makes a comment on Walker Evans’ photography stating that in Evans’ work the photography and the readymade appear closely related. 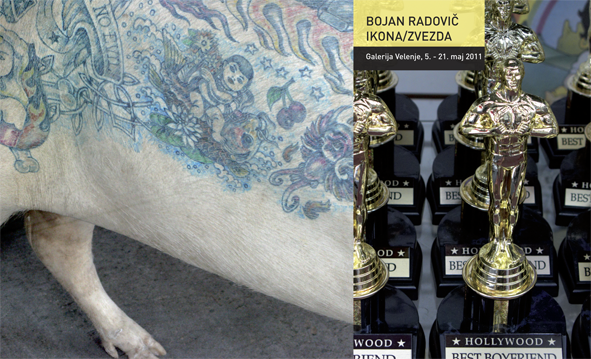 Something similar could also be said about this new photographic series by Bojan Radovič. Daniel Chandler, Semiotics for Beginners, 2006.